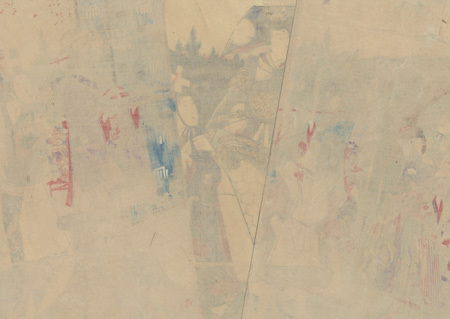 The Fourth Month, 1859 - Handsome triptych depicting Prince Genji and a group of lovely women traveling in procession. The young nobleman rides a dappled horse, flinging the sleeve of his robe behind his head as he looks up at a cuckoo flying past. A young boy carries his sword beside him, with a woman at right leading the horse by a slender rope. 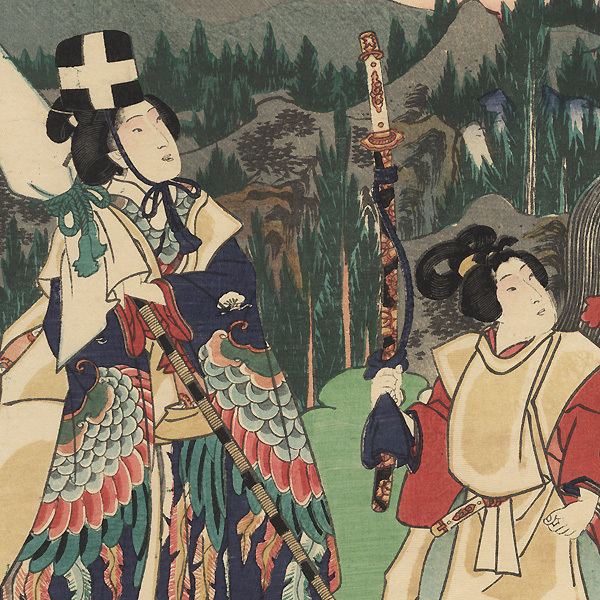 The beauties wear white vests over their elegant floral kimono, and tall black court caps, the woman at left carrying r a standard covered for traveling. A cloud-like border separates the figures from a mountainous background dotted with pines. A wonderful design, detailed with an embossed pattern on Genji's white sleeve, embossing on the horse's fur, and faint cloth embossing on the white vests. Image Size - 13 3/4" x 27 5/8"
Condition - This print with excellent detail as shown. Three separate panels, backed with paper. Small hole, repaired. Slight toning, a few creases and small marks. Please see photos for details. Good overall.